We have been seeing quite a number of different Atom based netbook under Eee PC family released by Asus. But if none of them suit your need, here is another unique one that may fit you in case you are looking for fancy and advanced features. Named as Eee PC T91MT, it is a newly announced tablet-like netbook that is enhanced with multi-touch technology suitable for business executive and professional as a good companion while on the move. Measured around one-inch in thickness, the machine is slightly thicker as compared to its siblings due to its convertible LCD screen. As usual, it is powered by Intel Atom Z520 processor as similar to other Eee PC models. Further backed up with 2GB memory RAM and a leading edge 32GB SSD (Solid State Device), it is quite suitable to be used as an advanced mobile computing device that requires more than typical office applications. What is so unique here is it even supports multi-touch capability that allows fingers touch and drawing on its 8.9-inch WSVGA LCD panel with 1024 X 600 resolutions for presentation or demonstration. Not to be lack behind, it is equipped with basic wireless LAN 802.11b/g/n for seamless network connectivity, as well as Bluetooth 2.1+EDR wireless technologies, on top of 0.3 megapixel built-in camera module, USB 2.0 host and Ethernet ports. 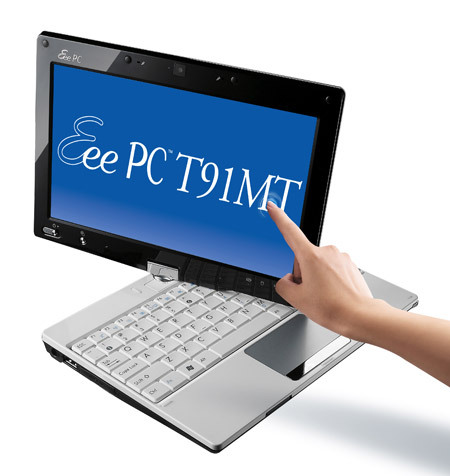 The Eee PC T91MT is currently available for sale and at a retail price of $530, it is a bit pricey as expected due to attractive features and hardware specifications. Anyway, it will be preloaded with Windows 7 as one of the most unique and advanced Eee PCs under this family.